6th Avenue Taproom – Four String Brewing Co.
Over the past 6 years our taproom in Grandview has grown from a small brewhouse and cellar with just a carry-out counter, to a full service taproom with over 20 different Four String beers on tap. Throughout the week you can stop by and enjoy a beer flight, catch some live music, watch a comedy show, play trivia, be a pinball wizard, or just grab a growler to-go. 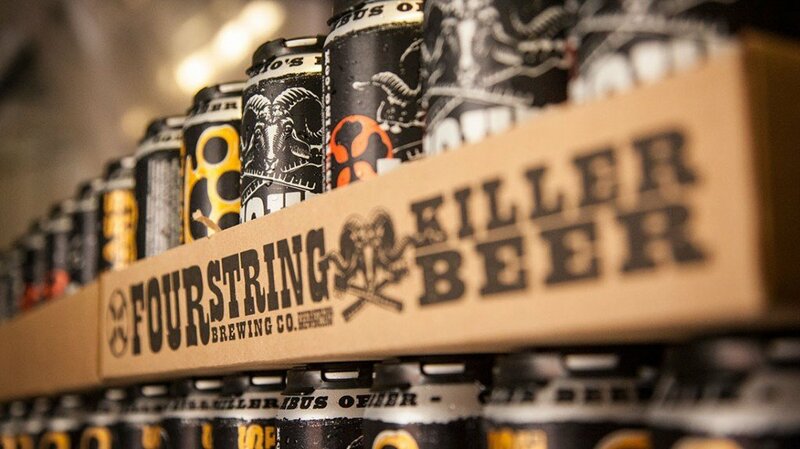 Wanna stay up-to-date on beer releases, events, promos, contests and all things Four String? Join our email list! We serve fresh baked Mama Mimi's Pizza every night of the week. Special Cask tappings at 12pm. Ask your bartender for a Cask Club punch card to earn rewards! Check out our Facebook page for other upcoming taproom events. The West Side Production Facility Taproom has free brewery tours on Weekends and can also help outfit you for your next party with kegs to-go, ice, keg taps, and keg buckets.